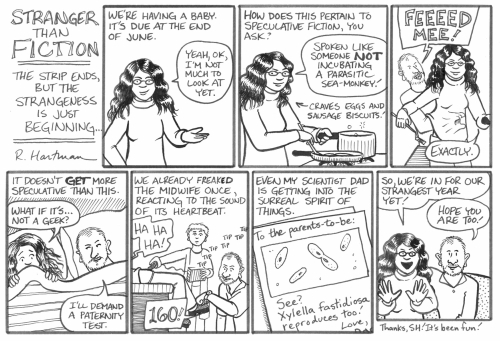 Stranger than Fiction: The Strip Ends, But the Strangeness is Just Beginning. . . .
Rachel Hartman gave up a million-dollar career in Comparative Literature to make comic books. Her work has appeared in the anthologies Rampage, Brainbomb, and SPX99, and her regular series, Amy Unbounded, has won two awards. When not obsessing over her storylines, she's reading about medieval economics or imagining she can dance. Rachel's previous appearances in Strange Horizons can be found in our archives.